I had another Teddy Bear Sleepover this past week, and did a "Cat Mouse Dog" theme. We read Kitten's First Full Moon by Henkes, Bark, George by Pfeffer, and Mouse Count by Walsh. We acted out Mouse Count with the props I made previously, and it was great. I always read the first part of the book, then switch over to the props when it's time for the snake to enter and find the jar. 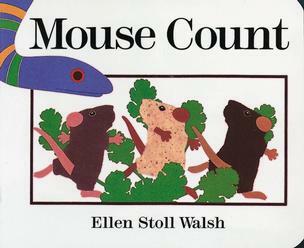 When I held up the book I said, "This book is called Mouse Count. What do you think it will be about?" "Yes," I replied and pointed to the cover, "Here are some mice. Who else do you think will be in the story?"